The net system did not need to be AVP worthy but it also shouldn’t fall apart the first time the ball gets served or hit directly into the net. The Sports Authority in-store options were either too expensive, too cheap or just didn’t satisfy all the features I was looking for. Of course, whenever I can’t find something locally, I end up on amazon.com. They definitely had a better selection of net systems that were under $200 and which also met most of my requirements. I settled on the Park & Sun Tournament 179 Volleyball set. Aside from the specs and features, the favorable reviews on amazon.com are what finally swayed me to purchase this system. Majority of the reviews were 5 stars and stressed the ease and convenience of using this system. The durability, light weight and easy height adjustability of the poles was mentioned in a good number of the reviews. The very few 3 and 2 star reviews mentioned the less than adequate ball off the net playability and issues with the tension system. Rigorous play over time will most likely result in a saggy net eventually. 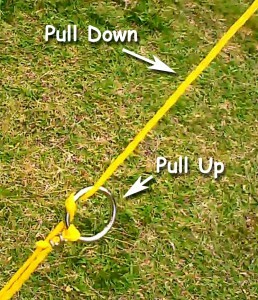 From my personal experience with this net system, the top of the net can easily be made taught again by adjusting the tension rings on the guylines with a pull-down and pull-up motion as pictured to the left. However, the bottom of the net which does not have the same tape reinforcement that the top strap does is pretty loose. I’ll have to agree, as already stated by other reviewers, that off the bottom of the net play is lacking. Despite these shortcomings and at this price point the Tournament 179 is still an enjoyable and very functional outdoor volleyball net system. 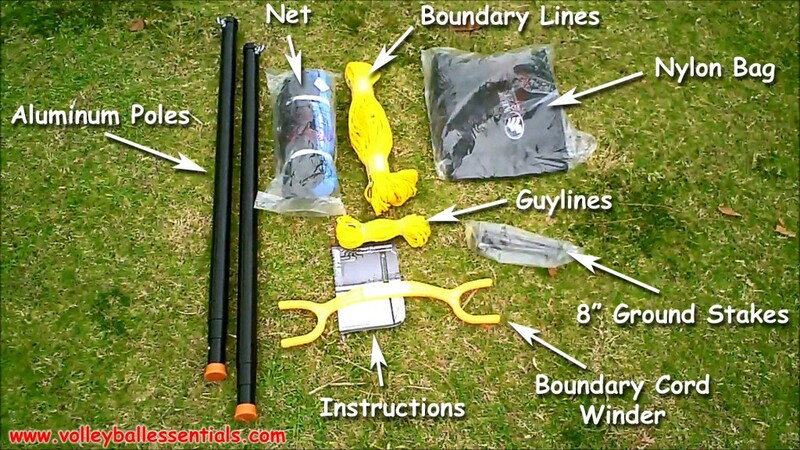 The Park & Sun Tournament 179 Volleyball net system can be purchased through various sports equipment retailers. 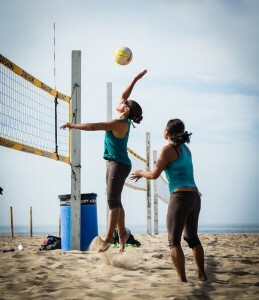 amazon.com is my online retailer of choice for any of the Park & Sun outdoor volleyball net system products. Some of the benefits of ordering through amazon.com include free shipping to most areas, easy returns, in-stock availability and best pricing.